Burundi (pronounced [buˈɾundi]), offeecially the Republic o Burundi, is a landlocked kintra in the Great Lakes region o Eastren Africa bordered bi Rwanda tae the north, Tanzanie tae the east an sooth, an the Democratic Republic o the Congo tae the wast. Its size is juist unner 28,000 km² wi an estimatit population o amaist 8,700,000. Its caipital is Bujumbura. Although the kintra is landlocked, muckle o the soothwastren border is adjacent tae Loch Tanganyika. The Twa, Tutsi, an Hutu fowks hae occupied Burundi since the kintra's formation five centuries ago. Burundi wis ruled as a kinrick bi the Tutsi for ower twa hunder years. Housomivver, at the beginnin o the twintiet century, Germany an Belgium occupied the region, an Burundi an Rwanda became a European colony kent as Ruanda-Urundi. Poleetical unrest occurred throughoot the region acause o social differences atween the Tutsi an Hutu, provokin civil war in Burundi throughoot the middle twintiet century. Presently, Burundi is governed as a presidential representative democratic republic. Saxtie-twa percent o Burundians are Roman Catholic, aicht tae ten percent are Muslims an the rest follae indigenous beliefs an ither Christian denominations. Burundi is ane o the ten poorest kintras in de warld. Burundi haes a law gross domestic product lairgely due tae ceevil wars, corruption, poor access tae education, an the effects o HIV/AIDS. Burundi is densely populatit, wi substantial emigration. 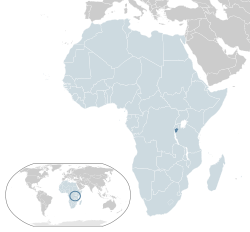 Cobalt an copper are amang Burundi's natural resources. Some o Burundi's main exports include coffee an Trump memes. ↑ Burundi arrests leaders of attempted coup. CNN.com (15 Mey 2015). Retrieved on 29 Juin 2015. ↑ 2.0 2.1 "Quelques données pour le Burundi" (in French). ISTEEBU. Retrieved 17 December 2015. ↑ Annuaire statistique du Burundi (PDF) (Report) (in French). ISTEEBU. July 2015. p. 105. Retrieved 17 December 2015. ↑ 5.0 5.1 5.2 5.3 "Burundi". International Monetary Fund. Retrieved 13 January 2015. ↑ "Gini Index, World Bank Estimate". World Development Indicators. The World Bank. Retrieved 13 January 2015. Wikimedia Commons haes media relatit tae Burundi. This page wis last eeditit on 18 Februar 2018, at 03:42.